How many times have you ignored your thirst while out on the trail? We’ve all been guilty of this, for sure. Thirst is a natural occurrence after all; it shouldn’t be much of a problem, right? Thirst is your body’s way of telling you that it needs water, and you need to listen to your body. As little as 5% body water loss can already lead to headaches and fatigue. A little more than that and you could end up with failing organs and a possible coma. This is the reality of dehydration, and it’s one of the things that you should avoid, especially if you like spending time outdoors. Dehydration occurs when your body doesn’t receive enough water. This can be due to various causes but in an outdoor setting, this is usually due to overexposure to the sun, leading to fluid loss. This also means you’re not drinking enough water to replenish those lost fluids. Other reasons for dehydration include excessive peeing caused by diuretic foods. Conditions like diarrhea, vomiting, fever, and diabetes can also cause dehydration. There are three types of dehydration according to WebMD: mild, moderate and severe. Let’s take a closer look at them. Some people are more susceptible to dehydration than others. This group usually includes the very young and very old. If you are outdoors with your toddlers or have senior companions, always monitor them for any of these signs and symptoms. Stop activity immediately. Get out of direct sun or heat and rest in a cool spot. Take off excess and restrictive clothing. Drink water, juice or sports drink. You should take in as much as 2L over the next couple of hours to replenish the fluids and electrolytes lost. Take an oral rehydration solution. This helps retain fluid and replenishes electrolytes. Rest and continue drinking fluids. Severe dehydration, however, is considered as a medical emergency and will need immediate medical attention. It will involve the use of IV fluids and the like. When you’re outdoors— or worse, in a survival situation— the chances of getting professional medical is slim to none, so it’s critical that you treat dehydration as soon as you detect it so it doesn’t escalate. As the old adage says “Prevention is always better (and less expensive) than cure” so make sure you know what to do and NOT to do to stop dehydration from happening. Keep hydrated. It’s as simple as drinking water at regular intervals. If you can, aside from always having water with you also bring a sports drink to replace not only fluids but also electrolytes. Don’t wait until you’re thirsty to drink water. Make it a habit to drink at least 8 glasses or at least 2 liters of water a day. If you somehow run out of clean drinking water, make sure you know how to look for water sources in the wild. However, do not drink water from outdoors without purifying it. Drinking water from unreliable sources can only make you sick and dehydrate you further. Avoid ingesting diuretic foods or drinks. Beverages with caffeine and alcohol, as well as food like parsley and ginger make you pee and lose fluids. Instead, pack up on foods that have high water content, like watermelons or cucumbers. Avoid direct sun exposure. Protect your face and neck with a hat or a shemagh. Wear light-colored, breathable clothing. Dark colors trap heat and would only make your body work harder to keep you cool. Keep oral rehydration solution packs with you. These help you replenish lost fluids and electrolytes. You can also make one at home with this formula. A lot of us underestimate and even ignore the benefits of good hydration. In fact, one study showed that as much as 75% of Americans don’t drink enough water and are actually living in a state of chronic dehydration. And that’s really a shame since drinking water is widely available. Don’t make the same mistake, especially when you’re spending time outdoors. Out there, you can’t control the environment. Don’t ignore your thirst. Listen to your body and take extra steps to make sure that your time outdoors is fun and safe by being well-hydrated. Any useful hydration tips that we missed? Let us know in the comments below! 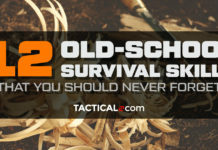 Previous articleWhich Grain Deserves A Spot In Your Survival Stockpile?